VFS Digital Design Talks - OOMPH! Our next Digital Design Talks event will be held on Monday, December 3th at 9:30 am! 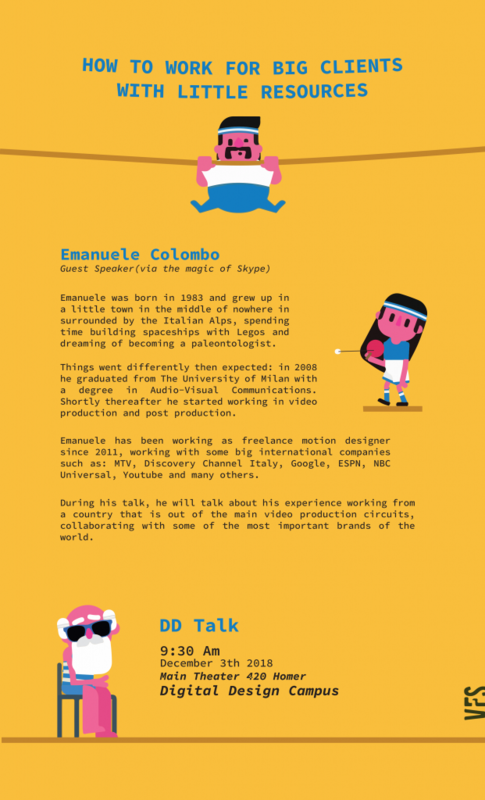 Emanuele Colombo from Italy will be talking about his work experience for big clients around the world as a freelance motion graphic designer. Last Wednesday VFS Digital Design Talks lecture series presented an inspiring and informative evening with J.R. Canest and Peter Gikandi. Presenting: Digital Design’s 23rd Graduating Class! “VFS Digital Design challenges you so hard, it makes a job seems like a stroll in the park.